PORT-OF-SPAIN, Trinidad (CNS) — One year after Hurricanes Irma and Maria smashed through the Virgin Islands, people remain jittery about the rest of the 2018 hurricane season. “Everyone is extremely nervous and anxious about going through another hurricane without recovering from the previous two,” said Warren Bush, chief financial officer for the Diocese of St Thomas. A combination of heavy bureaucracy, sometimes sluggish supply chains and a shortage of contractors have slowed recovery efforts, leaving repairs to many damaged homes and public buildings still incomplete. On Sept. 6, 2017, Hurricane Irma mowed through the islands and, two weeks later, Hurricane Maria devastated whatever was left. Both hit as Category 5 storms. 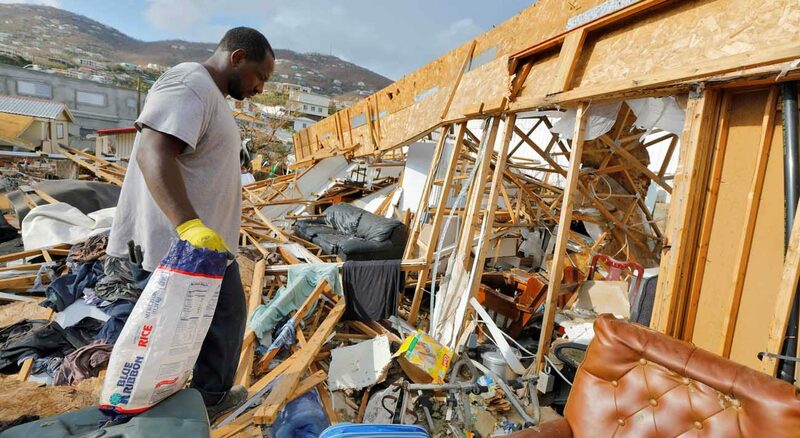 Both Bush and Bishop Herbert Bevard of St. Thomas credited the Federal Emergency Management Agency, Catholic Charities and insurance companies with getting restoration of diocesan and other properties underway. “Schools are still severely damaged in St. Thomas and St. Croix,” said Bush, adding that students and teachers are using the safer structures. Recovery in the islands tends to be slow, he admitted, citing mitigating factors that do not exist on the U.S. mainland when communities there are affected by storms. This also makes evacuation an impractical option. People literally have “less ability to reach a safe haven,” said Bush. “It would be physically impossible to evacuate people from these islands in one day,” said Shillingford, originally from the island nation of Dominica. Flights are limited, she added. He said the all-important tourism industry has been heavily affected. Shillingford recalls one taxi driver who “was taking care of her grandchildren. Her only form of income has been driving that taxi. We had to help her restore her business” and give additional help while things were slow. Catholic Charities operates five soup kitchens on all three islands; two each on St. Croix and St. Thomas, one on St. John. The agency serves 300-400 meals every day, up from 6,000 meals a year, the average before Irma and Maria. A mobile service delivers meals to people who cannot travel, like the many elderly people were abandoned after last year’s hurricanes. Bishop Bevard said the diocese plans to build more soup kitchens and improve outreach centers and homeless shelters on all three islands. Shillingford said people remain shaky when it comes to the weather. “Any time there’s a little rain,” said Shillingford, “people get agitated — adults, really. Children recover quickly; they look to the adults. If the adults pretend, the children feel it’s OK. Especially now, this week, people are kind of nervous,” she said as the winds of Tropical Storm Isaac fanned the islands.